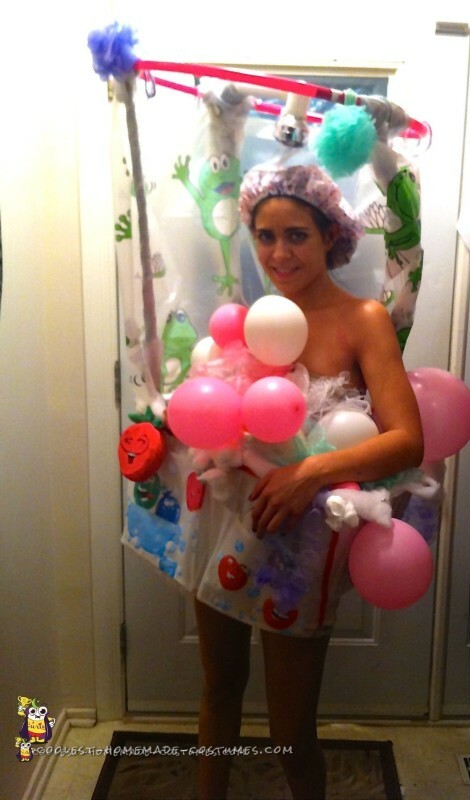 This shower costume was so much fun to make using old stuff we already had at home. You don’t need to spend a lot of money, just be creative. I love to do my own costumes, but I don’t consider myself as an artist or a good sewer, just a regular girl, who really like Halloween. To make the shower costume I used a lot of children accessories in my bathroom that I bought previously, on Avon, for the kids that I was taking care of. I used towels, body wash container, bathing toys, old bath curtain, facial cloths and more! I took some underwear, tan color, that I did not used really often. I used a few pins to attach balloons to the bra. You can use one or a few colors of balloons, but blow them with intensity levels, to create some balloons of different sizes. Don’t forget to wear some flip flop sandals! Manicure and pedicure is always great to complete the look! A shower plastic hat, is a good addition and the price is, in general, very affordable! A laundry basket was my shower costume bathtub :) Cut a little space in the middle, to fit your body. I used some pillows between my hips and the basket, for better comfort but also to keep the basket stable and to fill the empty space. You don’t want the basket to be loose and fall down during your walk or your party! Hold your shower curtain, on a kid plastic hoop. (Dollar store, few colors are available). The shower costume was original, but to put together this creation it took me a few hours. The idea was good, but the assembly was long, especially with the hoop. I used a lot of duct tape to connect the curtain, the hoop and the shower head all together. To simulate a water effect, I used some sparkling ribbon. 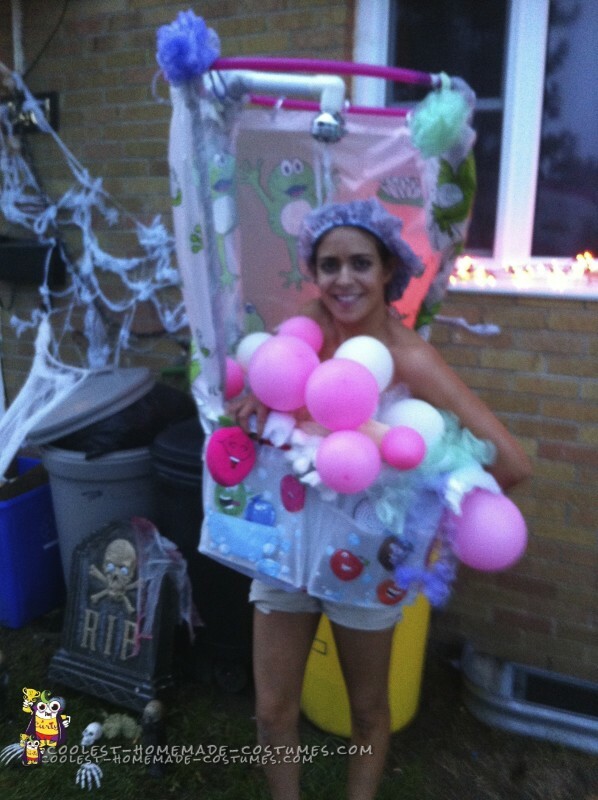 I am really proud of this homemade shower costume project, that I dreamt up a few years ago. The people in my neighborhood were really impressed!